Anyone who has taught their dog to pull them – whether on bike, scooter, sled, skis or rig, will have their own method of training – and not every method suits every dog or owner – but this is how it worked for Mary Glover and her Samoyed, Kiska. 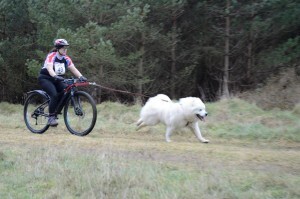 Kiska, was 12 months old when I decided to try running her on a bike – or bikejoring – I would be on my bike behind her, controlling her only by my voice commands whilst she would be harnessed and pulling me by a line. My first step was to train her to listen to my voice and learn several specific commands. (I should mention that you can start teaching your puppy these commands as part of obedience training from six to eight months old and you can run your pup on a bike at about eight to nine months old but only for half mile distances building up to 1 – 2 miles when they are nearly a year). The first command Kiska learnt was “line out”. This meant she must go forward until the line that attached her to me was taut and ready to pull. To get Kiska to understand me I attached the line (like a dog leash) to her harness which I held. I asked a friend to hold her collar and coax her to lean into her harness to take up the tension and walk forward whilst I clearly spoke the command “line out”. We practised this several times a week for 5 to 10 minutes at a time until she got the hang of it. Once Kiska understood “line out” the next challenge was to teach her a series of directional commands: “haw” meaning go left, “gee” (pronounced jee) meaning go right, “on by” – ignore whatever you are passing, “straight on” – keep going straight at a junction or crossroads and “whoa” – stop. We started gently with learning haw and gee. Two to three times a week I would put Kiska’s harness on and take her out on a ‘walk’ so she could learn her left and right whilst at the same time understand it was quite ok to pull me provided she was wearing her harness. I was always attached to her by the line which I held – and throughout this part of her training I was on foot. Every time I came to a corner I would say ‘haw’ or ‘gee’ depending on the direction. Some evenings we went to a public car park when it was quiet and I used the parked cars as objects to train round. And yes, I did get the occasional funny look! Kiska soon twigged what I wanted from her and over the weeks I added the remaining commands to her vocabulary in the same way – lots of repetition and rewards for good behaviour. When I felt she had got the hang of the commands and was quite happy wearing the harness I tied an empty plastic water bottle to the end of the line and let her drag it behind her. I wanted to make sure she wasn’t frightened with something dragging behind and making a noise. Kiska was now ready for the all-important next step – to learn to pull me on a bike. My first step was to buy an arm for the bike – this is a clever device that stops the line getting tangled in the wheels. Next, I needed to find somewhere safe for my first trial run. So far we had only gone at my walking speed – but now with the help of wheels we would be moving much faster. Would Kiska remember her commands – especially the all important whoa?! Luckily my friend’s farm had a nice flat grassy track, about half a mile in length. With the command “line out” Kiska set off and I pedalled to help and encourage her whilst my friend stood at the end of the track shouting her name. We did it twice and then called it a day, exhausted but excited – Kiska definitely had the knack. Over the coming weeks we trained regularly – two or three times a week – building up to two miles each session. Kiska improved steadily, building her strength and fitness – as I did too. I should say here that how quickly you progress depends on many factors and will be different for each dog and owner. I am fortunate in being small, light and fit (though by no means a spring chicken!) and I knew I was not over-taxing Kiska when we first started training. Although I really enjoyed running her on my bike, what I really wanted was to try her on a scooter. Dog scooters are simply larger and more robust versions of regular scooters. 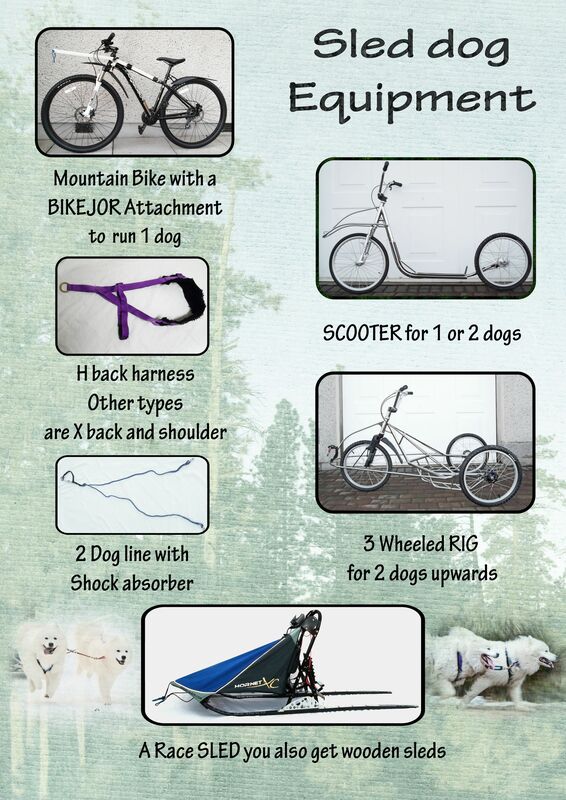 Pulling a scooter is much harder for a dog as they have to pull your weight – you have no pedals to help them. Initially, I borrowed a scooter to make sure Kiska was happy to run off it, which she was, and then I took the plunge and and bought my own scooter. By this stage I realised I was hooked. I was keen to develop my partnership with Kiska, hone my ‘mushing’ or driving skills and compete in rallies. But first, I needed to set up a training programme to make sure we were both fit and able. Fortunately I was lucky to find a group of ‘mushers’ on Facebook who trained at a local forest and who were happy to help me. I applied for a permit to run Kiska in the forest which is owned by the Forestry Commission. The Forestry Commission requires a contract to be signed and relevant insurance supplied. You must have public liability, and insurance for training and racing. Insurance can be got from SHCGB (Siberian Husky Club of Great Britain) – some pet insurance companies offer it, but do check first. Over the winter and into spring I took Kiska to the forest to train each week. Additionally, I knew I needed to build up her general stamina and fitness, so I found a local park where they were happy for me to run her on their trails (parts of which were bridleways). 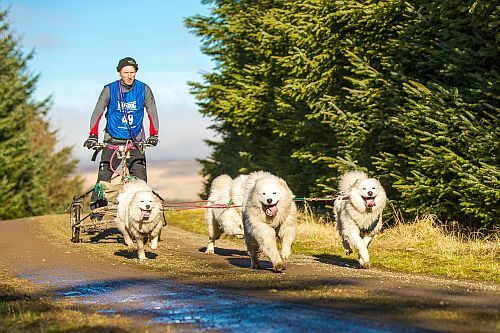 I never ran Kiska on tarmac, roads, pavements or any hard surfaces as it would have damaged her pads and joints – I kept to bridleways, byways and tracks. So, once a week we were running in the forest over two to three miles, and then twice a week in the park for around two miles. If I was running her on the bike instead of the scooter we would go for longer runs up to five miles. Once the warmer weather arrived we trained very early in the morning or in the evening if the temperature had dropped sufficiently. It’s important that dogs aren’t run in temperatures over 15 degrees centigrade as they overheat very easily – it would be like you or me trying to run in a huge duvet whilst pulling a heavy weight. Consequently I normally start training in earnest in September – good timing as the first rallies start end of October/beginning of November and finish mid March. Once you decide you want to compete you need to have the relevant insurance and have membership of the club(s) you want to compete in. Most club websites have useful tips and information regarding the trail markers on the courses and what they mean – this is technical knowledge which you will need to learn and understand. 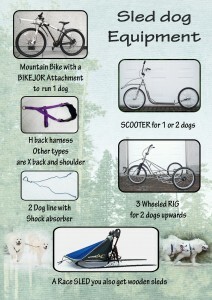 It goes without saying that you and your dog must both be fit and raring to go. Samoyeds need to be 12 months before they can compete. And you will need to decide at what level you want to compete which means understanding the different options and requirements for each competition. For example, most clubs run a bikejor class (BKJ) or a scooter class (S). 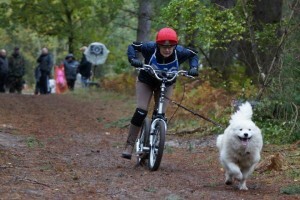 A Bikejor course distance can vary from 2 to 4 miles – 1 dog, and a Scooter course distance from 1 to 2 miles – 1 dog. Entry forms for individual classes can be found on club websites along with the closing dates for entries (usually two weeks beforehand).Competitions take place at weekends and on the Saturday morning there is a ‘mushers’ meeting for you to attend. This is when you get details of the course, and can flag up any concerns or issues. Next you collect your bib number, check your start time and look at the course layout for your particular class. It will show the distance and you can see how many turns there are. I always take a photo of the course and my start time on my phone so I can make a clear mental picture of the course. Scooter classes are normally run towards the end of the rally so you may find some time on your hands. It’s a good idea to walk your dog regularly throughout the day for their toilet needs and to keep their muscles warmed up. Make sure you get to the chute – the starting gate – approx 2 or 3 minutes beforehand as you don’t want to miss your start time. Most of all, remember to enjoy the day – it’s fun, your dog will love it and so will you – it’s a team effort. Have a drink of water handy for your dog when you return from the run and always give them a walk after to let them cool down and unwind. 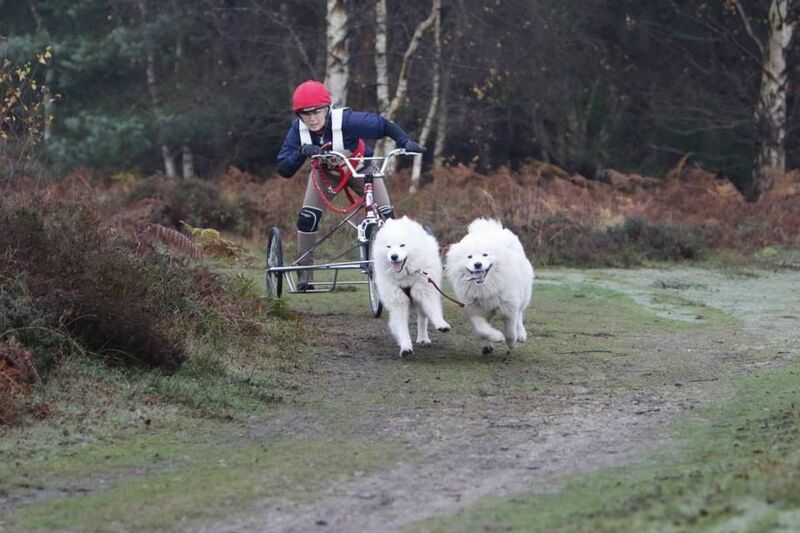 Over the 2013/2014 season I ran in scooter classes but this season 2014/2015 I shall be running in 3 x dog freight classes with my Sams – as you can tell, I am totally hooked.